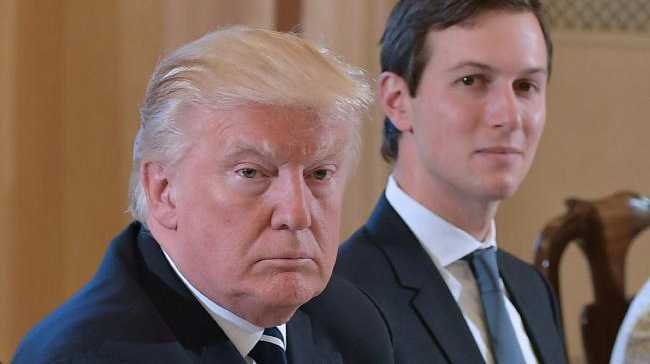 A KEY business partner of US President Donald Trump and Jared Kushner is reportedly pursuing a $US2 billion ($2.65 billion) government contract to build a new FBI headquarters, sparking conflict of interest concerns. Vornado Realty Trust is one of three finalists for the rights to develop the campus in Washington DC, ABC News in the US reports. The New York real estate firm's founder and chairman, Steven Roth, is a longtime friend and occasional adviser to President Trump. He even travelled last week with him to Cincinnati as part of President Trump's "Infrastructure Week", with the US leader hailing Mr Roth on stage as one of the "greatest builders in America." Mr Roth's firm is jointly invested in two buildings with the Trump Organisation, and it is negotiating with the Kushner Company over its investments in the 666 Fifth Avenue skyscraper in New York. "It creates a huge conflict," said Representative Gerald Connolly, Democrat who sits on the House Oversight Committee. "It's an enormous project. The exposure here for the Trump administration is very real." A spokesman for Mr Kushner said he was taking White House ethics "very seriously" to avoid a conflict. Mr Kushner, Mr Trump's son-in-law and senior adviser, has previously faced conflict of interest accusations. His sister last month courted individual investors in China with a much-criticised federal visa program that provides a path toward obtaining US green cards. Mr Trump faces a fresh legal battle with politicians from two states threatening to sue him over allegations he violated anti-corruption clauses of the Constitution. The Washington Post reports attorneys general for the District of Columbia and the state of Maryland are alleging President Trump has accepted millions in payments and benefits from foreign governments since moving into the White House. The lawsuit centres on the fact that President Trump retained ownership of his company when he became President - an issue he has faced criticism over before. In January, he said he was shifting business assets into a trust managed by his sons to eliminate a potential conflict of interests. At the time, President Trump told a news conference he had formally given "complete and total" control to his sons while his lawyer, Sheri Dillon, said he had "isolated" himself from his businesses. However, the Office of Government Ethics said his plan didn't "meet the standards" of former presidents. According to The Post, D.C. Attorney General Karl A. Racine and Maryland Attorney General Brian E. Frosh said President Trump has broken many promises to keep separate his public duties and private business interests, including a promise from his son Eric Trump that the President would continue to receive regular updates about his company's financial health. A signed copy of the lawsuit allegedly provided to The Post reportedly alleges "unprecedented constitutional violations" by the President. The suit says his continued ownership of a global business empire has rendered the President "deeply enmeshed with a legion of foreign and domestic government actors" and has undermined the integrity of the US political system. "Fundamental to a President's fidelity to [faithfully execute his oath of office] is the Constitution's demand that the President ... disentangle his private finances from those of domestic and foreign powers. Never before has a President acted with such disregard for this constitutional prescription," The Post reported the lawsuit as alleging. If a federal judge allows the potentially explosive case to proceed, it could compel President Trump to release copies of his personal tax returns to assess the extent of his foreign business dealings. The constitutional question D.C. and Maryland will put before a federal judge is whether Trump's business ownership amount to violations of parts of the Constitution known as the foreign and domestic emoluments clauses. The first family is together again under the same roof: the White House. After nearly five months of living apart, President Trump's wife, Melania, announced on Sunday that she and the couple's young son have finally moved into the executive mansion at 1600 Pennsylvania Ave. Mother and son broke with tradition by living at Trump Tower in New York since the inauguration so that Barron, now 11, could finish the school year uninterrupted; the president lived and worked at the White House. "Looking forward to the memories we'll make in our new home! #Movingday," the first lady tweeted on Sunday evening after she and Barron arrived at the White House with President Trump. The tweet accompanied a photo of the Washington Monument as seen from the White House Red Room. Now that's she's at the White House full time, pressure will build for her to be seen more and to do more. She said during the campaign that she would work on the issue of cyber-bullying as first lady, but she has made no further announcements about the subject.